A perfectly usable budget Android tablet for newcomers who don't require internet access on the go. By partnering with Google and introducing the world to the original Nexus 7, Asus became a de-facto leader in the small form factor tablet market. At that time, Samsung and Amazon were the only other major players, but backed by Google's marketing and some incredible pricing, Asus had a game changer on their hands. 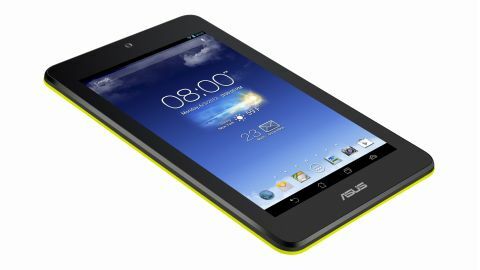 In an attempt to dine out on that success, Asus has launched a number of follow-up tablets, clearly utilising its experience with the Nexus 7. The latest of these offerings is the Memo Pad HD 7. Unlike the company's previous Memo Pad offering at this size, the HD 7 comes packed with a bevy of excitingly high-end sounding specifications and backs those up with a range of bright, glossy colours, all for a retail price of just £129 ($149, around AU$170). Comparisons with the original Nexus 7 are inevitable here. The HD 7 is very similar in size, being just a smidge wider and thicker, but gains back the advantage by forcing you to carry a little less heft at just 302g, compared to the 340g of the Nexus 7. This reduction in weight is despite that minor increase in overall size, with dimensions of 196.8 x 120.6 x 10.8mm. The similarities don't end there, as the HD 7 offers a 7-inch screen at the same 1280 x 800 resolution as the original Nexus 7, and also arrives with a quad-core processor and 1GB of RAM. Despite having similar specifications on paper, the processor is significantly different to the Tegra 3 in the original Nexus 7. It is a MediaTek MTK8125 which is very similar to the MTK6589 that can be found in many Chinese market phones, but it doesn't contain cellular radios. Indeed, there is no cellular version of the HD 7. This is a very interesting choice of system from Asus, something it has a history of doing. MediaTek designs its processors to be inexpensive but with good performance and good battery life, and the MTK8125 here is no different: it contains four ARM Cortex A7 cores. Unlike many other budget tablets, Asus hasn't skimped on the screen. It has the same resolution as the original Nexus 7, which offers a high 216ppi density, comfortably beating the iPad mini and the Samsung Galaxy Tab 3 7.0 - but it falls down when compared to the 2013 Nexus 7 and iPad mini 2. This bears out in use, with a nice sharp screen that's bright and clear. It's perhaps not quite as good as the best in the business, but it's a step up on the previous Asus offering with this size screen, the FonePad. Being an IPS LCD screen, it has fantastic viewing angles. It does suffer from a little more glare than we would like and the colour balance seems a little favoured towards a yellowish tint, but these are minor complaints. The only real negative is the lack of auto-brightness control, but leaving the brightness at a middle setting is good enough most of the time. If you have used the original Nexus 7, then holding this latest Asus offering is initially going to feel quite familiar. But after a few moments, some differences become clear, the first of which isn't positive. As your fingers run over the back of the tablet, you may feel as I did that the glossy plastics are not of the highest quality, managing to achieve a slightly slimy feel and offering no grip. To avoid the tablet slipping from my hands I grabbed it by the sides, and in one hand it is just ever so slightly too wide to be comfortable. The original Nexus 7 also had this flaw and the tiny increase in girth here does nothing to help. Neither does the noticeable seam between the coloured back and the glossy black chamfered edge which gives the impression of a cheap third-party case. It's certainly not the worst compromise Asus could have made, but the tablet is clearly designed this way to achieve its low price point. Holding the HD 7 with one hand between thumb and forefingers is a comfortable grip that can be maintained for some time, no doubt due to its relative lightness and weight balance. Spread your fingers out over the back and the neatly etched Asus logo becomes obvious. The 5MP rear camera is housed in a small bulge, but thankfully the lens is recessed slightly as the tablet rests on the moulded plastic. When using the HD 7 on a flat surface, its curved back can cause the tablet to rock slightly against that bulge. There is no camera flash. It would be a neater and cleaner design if Asus had been able to make the camera housing flush, as it has on the new Nexus 7. Above the screen on the front is where Asus has housed the 1.2MP front facing camera. It is very visible but at least it's centred, unlike on some other Asus devices including the new Nexus 7. Putting an item like that off-centre does nothing for my OCD. On the left side of the device are the rather excellent buttons, with the one piece volume key sited just below the power button. They don't have a very responsive feel but they're easy to find with your fingertips. The buttons are coloured to match the finish of the rest of the rear, blending in nicely. Unusually, the HD 7 has its micro-USB port located on the top of the device next to the standard 3.5mm headphone jack, with the microphone hole sited between these two ports. While it's uncommon to find the USB port on the top of a tablet of this size, it is ergonomically sound as the HD 7 is simple to use while charging. The positioning of this port also helps reduce the costs of manufacturing the tablet, as the circuit board has the connection for the port at the top. Asus has avoided running a cable to the bottom of the tablet as it had to on the original Nexus 7. The HD 7 has 16GB of internal storage, although only around 12GB is available initially. Expandable storage is provided through a microSD card slot on the left side of the tablet and is simply open to the world - I fear it could become filled with dust and dirt. The card clicks in and is simple to remove, while being held in securely at the same time. Asus also provides 16GB of cloud storage for one year. Asus has managed to include stereo speakers in the HD 7 despite there being just a single speaker grill. The two physical units are housed behind it and provide some satisfyingly loud output. They do distort quite heavily at high volumes, which is no surprise given just how loud they go. The final piece of the puzzle in the make-up of the HD 7 is the battery. It's the same basic capacity as in the new Nexus 7 at 15Wh. Asus quotes 10 hours of battery life, which seems a bit optimistic but not entirely unrealistic. The tablet sips power during extended sleep periods and has a fairly efficient chipset, but the overall battery life falls short of the original Nexus 7, not to mention the iPad mini. It is however fairly rapid to charge despite the power plug adapter provided in the box not having as high an output as some that are provided with tablets.